The far south of Maluku and not easy to get too. 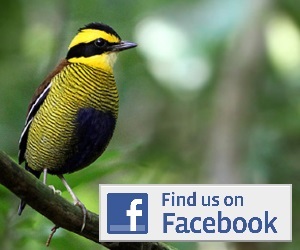 If you make it, the reward is accessible forest packed with endemics. I just spent 5 days in Tanimbar from the 3rd to the 8th of February 2019. From the excellent report by Ross Gallardy (2017) I heard about the new homestay for birders at the so called Goffin Lab at about km 25 on the road north of Saumlaki. The owners Emus and Vera Samangun understand what birders want and need. The rooms are clean and simple and the food is among the best I had anywhere in Indonesia. At the moment the cost is a modest 300.000 Rp per night including 3 meals and unlimited coffee, tea and water. Airport pickup by bike is 50.000. 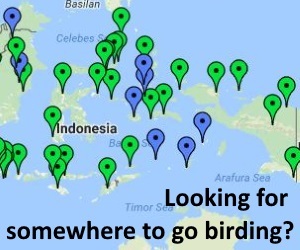 Here you are in the middle of the good birding area about 2.8 km north of Kebun 45. Opposite the homestay a small trail passes some plantation and reaches good forest quickly. After a few hundred meters you reach an active and protected nestmound of Tanimbar Scrubfowl, where you can see the birds at dawn, if you are lucky. I saw 2 birds on my first morning there. Emus can show you 4 other trails, that all reach good forest in walkable distance from the homestay. I had all diurnal endemics and specialities here in 4 days, but missed both owls in spite of a lot of effort. The Boobook was heard a couple of times but did not respond, the Masked Owl was not even heard. This place is perfect for independent birders and both Emus and Vera speak enough English to make your stay here easy.